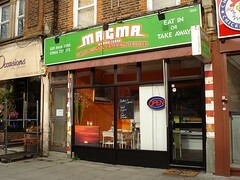 Magma was a Ghanaian restaurant in Thornton Heath. It has now closed, and as of April 2016 the premises are vacant and stripped out. Ghanaian restaurant in Thornton Heath. It's quite small; there's seating for only about a dozen people at cafe-style tables with brightly coloured vinyl tablemats and artificial flowers in tall vases. The walls are painted bright green and orange, and a quirky clock decorated with colourful plastic cutlery hangs near the ceiling. Laminated menus sit on the tables, alongside liquid soap and lotion for washing one's hands before and after eating. African groceries, dried fish, and packaged staple foods such as banku are displayed behind a counter. Kake visited on a Monday lunchtime in March 2015. There were no other customers when I arrived around 12:30pm, and this remained the case during my visit. Music was playing, via some very glitchy music videos on a flatscreen. I decided to try the banku, a West African carbohydrate staple food made from a fermented mixture of maize and cassava. The owner recommended I have the palaver sauce with this, and offered me a choice of fish or chicken on the side (I chose chicken). This came to £6.50 altogether, with a portion size more than enough for me photo. The palaver sauce was a mixture of spinach, broccoli, green beans, and peas in a savoury oil-based sauce; it was very tasty. The chicken was nicely done too, with well crisped skin but not overcooked. A savoury chilli sauce came in a separate little dish. Kake's verdict: I'd like to come back and try more of the menu, particularly the omotuo (rice balls) as I've not had these before. I'd definitely order the palaver sauce again. Accessibility: A step to get in. Not sure if there's a customer toilet. Last visited by Kake, March 2015. Last edited 2016-04-07 14:24:23 (version 4; diff). List all versions. Page last edited 2016-04-07 14:24:23 (version 4).